Bill Murray loves love, and he loves people being in love. On the Today Show with Matt Lauer on Tuesday, Murray was promoting his new film St. Vincent, but what he really wanted to wax poetic about was George Clooney and Amal Alamuddin's Venetian wedding, which Murray not only attended (arriving in style in a water taxi) but where he also gave a toast to celebrate Clooney and Alamuddin. The Ghostbusters legend is known for hangin' about town and crashing into the lives of us meager common folk, bringing joy and wisdom and that Murray whimsy wherever he goes. 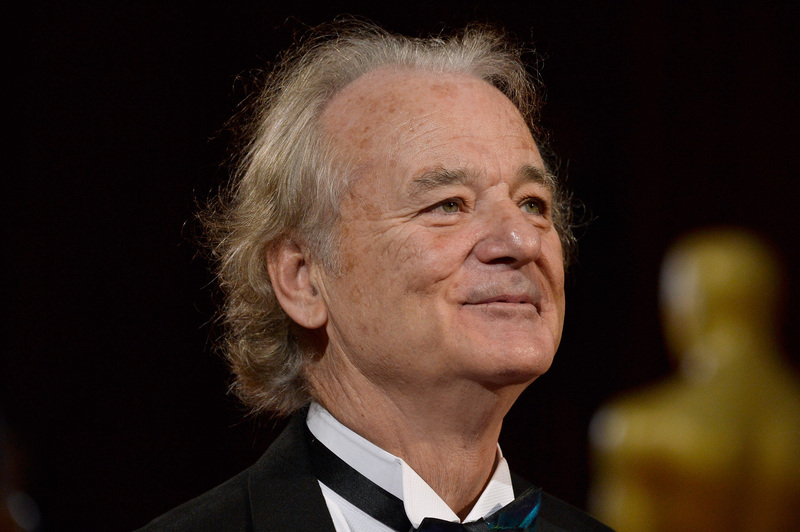 But to be close enough to Bill Freakin' Murray that he would give a toast at your wedding and then go around with heart-eyes about your love story? George Clooney is one blessed son of a gun. Murray said on Today: "These two, it's kind of just miraculous that they found each other, because they're so ideal for each other. People were very emotional about the fact that these two people found someone. That really was the great part of the party." Who would have thought Murray to be such a hopeless romantic? But where is the transcript of that toast? The 64-year old said that he couldn't recreate the toast on television, shrouding it in that same Bill Murray mystery that surrounds everything he does. So what could it have been? Maybe Murray gently whispered his toast into only Clooney and Alamuddin's ears, barely audible to the rest of the wedding guests, leaving them maddened and confused and Murray very smug and satisfied. Secrets must be extra fun for Bill Murray. Bill Murray loves his karaoke probably as much as he loves his pal George Clooney. In one of his mythic appearances out in the wild, Murray sang Elvis' "Marie" with some extremely lucky strangers, and I think an Elvis ballad would be the perfect serenade from Murray to Clooney and Alamuddin. As those wise men say, only fools rush in. The twang of Bob Dylan is obviously not lost on Murray, and it wouldn't be surprising if he borrowed some of the folk singer's poetry to send up Clooney and his lovely lady. He's a man that wears many hats, and ruffs, and false noses. Bill Murray, jovial hero that he is, loves a good costume. In fact, every time he has appeared on Late Night with David Letterman, he's arrived in some sort of ridiculous getup. He could have brought a similar disguise along to the Clooney-Alamuddin nuptials, to give his toast that dramatic flair; I would like to see Bill Murray perform a wedding toast as Benjamin Franklin, but that's just my personal preference. The way to the heart is through the stomach, and that's a fact not lost on Bill Murray. In fact, he loves ice cream socials. Perhaps Murray forewent the traditional boozy toast and instead bought gelato for the whole of the wedding party and guests, and made some ice-cream based puns. Bill Murray making food puns: my dream of dreams. But whatever it was, I'm sure it was heartfelt and funny and a little rough around the edges with a dirty joke thrown in or too. Bill Murray knows how to command a room, that's for damn sure, and as happy as I am sure that George Clooney is to have married such an amazing, brilliant woman, even he might agree that the best part of his wedding was Bill freakin' Murray.